You can buy masala in the store, but there is absolutely no comparison between store-bought and the freshness of a masala you make yourself. The term “masala” just means “mixture”, and so a masala is one of any number of spice blends. Garam masala is the most well-known blend, but there are chai masalas, chaat masalas, egg roast masalas, and garam (or warm) masala–so called because it is made with “warm” spices. There is regional variation in garam masala–the more traditional Persian (or mughal) influenced garam masala has no cumin or coriander seed, which is prominent in the better known Punjabi, or northern, garam masala. The process is very similar among all the blends, and is simply dry roasting, and grinding. The spices stay reasonably fresh in a sealed container, for a couple of months. You can tweak all the following recipes to suit yourself. 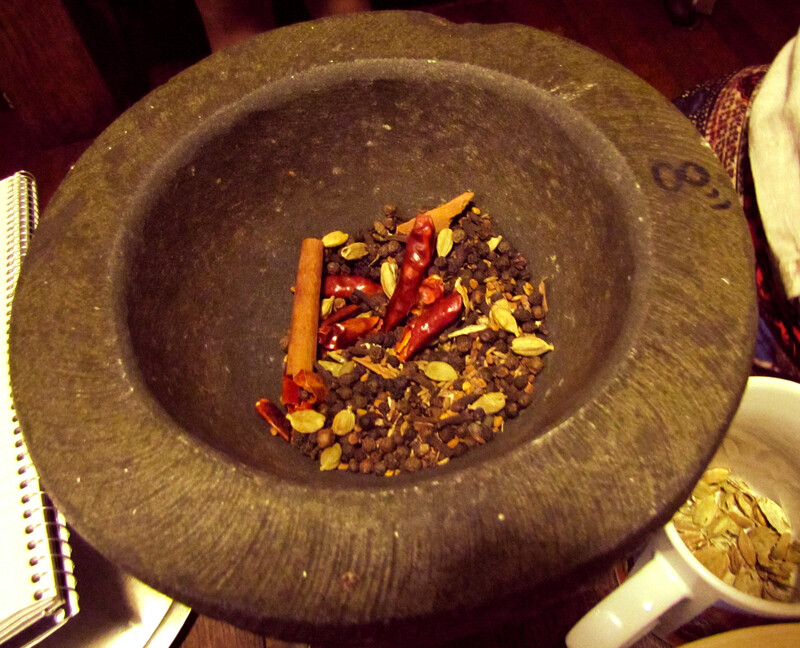 If you are using a mortar and pestle, the common cinnamon is too hard to grind. Either use the softer Mexican/Sri Lankan cinnamon, or add ground cinnamon after the fact. You can either make the full recipe below, or scale down to a half or a quarter. Don’t worry if it doesn’t get perfectly smooth, like a store-bought blend. You can sift out the biggest chunks if you like, but it’s nice to encounter a bit of clove or cumin in your food. – – 1/2 cup (100ml) coriander seed. Break up the cinnamon into bits (if using whole). Start toasting the spices in a hot pan over medium high heat, in the order given in the ingredient list. It is done when the spices become fragrant. The cardamom and pepper should puff up a little, and wiggle around. The cumin might start to pop. Don’t let it burn. Remove the spices from the heat, and tip them into a cool bowl. Take the seeds out of the cardamom, and discard the pods. Grind the spices in batches, in a grinder or a mortar and pestle.